Libyan militias parade though Tripoli, Libya. 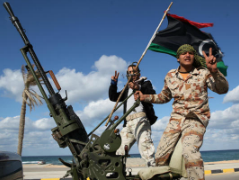 The Libyan government has already taken steps to ensure the militias disband. According to the Libya Herald, the National Army drove a “reengage army division” from its base near Tripoli’s airport road, one day after the government had issued its ultimatum. Furthermore, the Army reported it had raised the Secondary Technical Barracks, another prominent militia, and that it had “arrested all the members of the group as well as confiscated the weapons found at the location.” In Benghazi an agreement has been reached between the government and a number of the militia groups to bring the militias under army control. Although the Libyan government used public anger as the rationale to disband the militias, it has also been an important step in diminishing international pressure. Since the deaths of 11 Americans, a number of foreign embassies remain on security lockdown. Many embassies fearing “jihadist units in the capital will seek revenge for the humiliating rout of their comrades” being disbanded, the Libyan government had a strong incentive in maintaining control and order within the country. Overall, the move seems to be working. For example, the Raffala al-Sahati milita, whose soldiers shot a number of the 11 protestors killed over the weekend, told Libya’s state news agency “they had decided their role was over” and would disband. Furthermore, according to The Guardian, Benghazi officials are allowing an FBI team to come to Libya to join in the investigation of the deaths of the 11 Americans at the consulate. The Libyan government still faces a number of obstacles and even though Libya’s first free election in decades took place in July, it needs to remain cautious in ordering the militias to disband. Not only does the government rely on the militias “for protection of vital institutions and has used them to secure the borders, airports, hospitals, and even July’s elections” but the militias are also an important contracted security force. In the coming weeks, it will be essential for the government to continue to call for the disbandment of the militia groups while maintaining dialogue and cooperation with such groups at the same time to stifle violence and continue legitimizing state authority. Victoria Kelley is a 3L at the Sturm College of Law. She is currently the Alumni Editor for the Denver Journal of International Law and Policy and a member of the Jessup International Moot Court Team. been discxussed foor many years. Excellent stuff, just great!